After many years of flipping perfect flapjacks for you or at least pouring milk in your cereal for breakfast, you can take the opportunity this Mother's Day to return the favor by taking your mom out to a special brunch in Denver. Mother's Day falls on Sunday, May 12, 2019, and there are plenty of great restaurants throughout the Denver area to take mom for her special day. From Italian fare at North Italia to modern Mexican at Lola, Denver's diverse restaurants offer many choices to make mom happy. Be sure to book your reservations in advance, especially if you plan on dining out with a large group for Mother's Day, as tables fill up quickly on this special holiday. It's recommended that you book your reservation at least a month in advance to ensure you and your family can enjoy a great meal without the hassle of trying to find a table day-of. 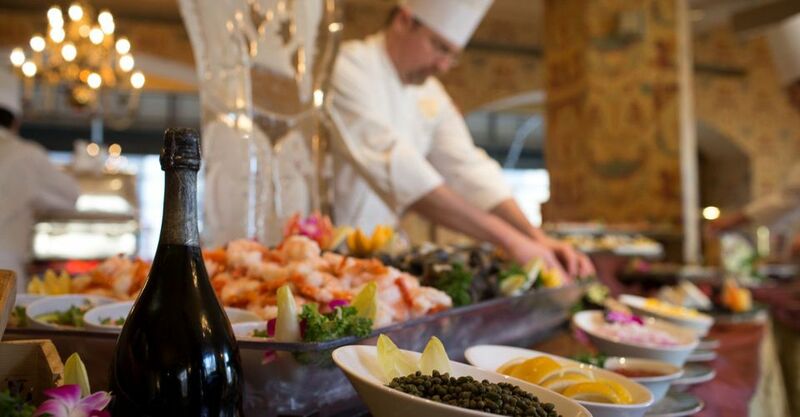 The Dom Perignon champagne brunch at Ellyngton's at the Brown Palace will pamper mom with carving stations, seafood selections, and plenty of premium champagne this Mother's Day. Known for its extensive selection of creative dishes, the brunch menu at Ellyngton's features entrees such as eggs Benedict, lemon poppy waffles, brioche French toast, and a lobster scramble. The historic Brown Palace hotel downtown has housed many of Denver's elite since its construction in 1892 and continues the tradition of luxury today with prices of more than $100 for the brunch service. Reservations are required, and it's recommended that you book your table at least two weeks in advance of the holiday. Coohills, an eatery helmed by chef Tom Coohill and located in Denver's oldest neighborhood LoDo, offers a brunch buffet with a raw bar of shrimp, oysters, and smoked mussels for moms who love seafood. Other brunch items include herb-crusted prime rib and roasted turkey as well as Chocolate Nemesis cake for dessert. Brunch costs $58 for adults (alcoholic drinks cost extra) and $20 for children and will take place from 9 a.m. to 2 p.m. on Sunday, May 12. Reservations are not required to attend, and tables should be available throughout the day; however, you may have to wait for a spot for your family if you come during the peak brunch hours from noon to 2 p.m.
Dazzle your mom with live jazz performed onstage by the Julie Monley Quartet, featuring the vocal talents of Denver native Julie Monley, which will take the stage from 9 a.m. to 2 p.m. on Mother's Day this year. While you mellow out in the dining area with omelets made to order and a top-notch brunch buffet, mom can kick back and enjoy conversation and great food. For an additional cost, you can add on all-you-can-drink mimosas and Bloody Marys. Named the "Best Brunch in Denver" by Westword Reader's Choice, the Sunday brunch costs $35 ($18 for children 6 to 12). Reservations are required, and a five-dollar down payment (which will go toward your meal cost) is required to book your table during the special Mother's Day event. If you're traveling to Denver with a vegetarian mother, there's no better place in the city than WaterCourse foods for a Mother's Day brunch without meat options. Located in City Park, the vegetarian menu at Watercourse Foods also includes gluten-free options; the buckwheat pancakes are surprisingly good. Watercourse Foods serves breakfast all day from 8 a.m. to 10 p.m. on Sundays, including Mother's Day this year, and also serves up a specialty brunch every Saturday and Sunday from 7 a.m. to 3 p.m.
Trendy moms can enjoy the hipster ambiance at Snooze, which has several Denver locations including an outpost at Union Station. Indulge your sweet tooth with cinnamon roll pancakes or dig into several delicious varieties of eggs benedict. Although Snooze isn't the best choice for moms on a diet as low-calorie options are limited, yours is sure to enjoy the sweet menu, which changes seasonally and includes a number of made-from-scratch selections. Founded in 1997, Tavern offers a brunch buffet from 10 a.m. to 2 p.m. on Mother's Day this year at three of its locations: Tavern Lowry, Tavern Tech Center, and Tavern Littleton. The buffets feature prime ribs, smoked salmon, and omelet stations, and moms who are fond of quaffing champagne or bloody marys can add bottomless mimosas for a low flat rate. Brunch is $32 for adults and $12 for children under 12, and every mother also receives a rose with her meal. The Capitol Hill eatery Jelly Cafe is giving Snooze a run for its money as hippest breakfast joint in town. Jelly Cafe makes its doughnut holes in-house and also offers a twist on old favorites such as pancakes and biscuits and gravy. Gluten-free items are available on the menu as well as a few low-calorie options. Although Jelly recently opened a second location on East Evans Avenue in Denver, you should still expect a wait at either location on Mother's Day. Be sure to book your reservation well in advance as spots at these small, hip cafes fill up quickly any time of year—but especially on holiday weekends. If you're looking for a brunch spot with an excellent view of the Denver skyline, head over to Lola Mexican Fish House on Boulder Street, where you can enjoy a full meal from the patio of this Highlands eatery. The Mexican restaurant's brunch menu features American classics such as chicken and waffles as well as Latin-inspired favorites such as the Yucatecan breakfast. Brunch is served from 10 a.m. to 2 p.m. on Saturdays and Sundays, including Mother's Day weekend. Lucile's Creole Cafe has several locations in the Denver area and offers breakfast favorites with a Creole kick. Originally opened in 1980, this New Orleans-inspired cafe has always strived to provide excellent food in a comfortable yet unique atmosphere. Now voted as one of the best casual dining experiences in the city, Lucile's Creole Cafe offers something for everyone on its brunch menu. Try the Eggs New Orleans for a spicy take on eggs benedict, and don't forget to start off or finish your meal with beignets. Lucile's does not accept reservations, so you should expect a bit of a wait on Mother's Day. North Italia, a modern Italian restaurant in the Cherry Creek neighborhood of Denver, offers brunch with Italian and American influences every Saturday and Sunday from 11 a.m. to 4 p.m. Menu highlights include the savory vegetable scramble as well as the sweet French toast made from brioche bread pudding. Other popular dishes include zucca chips, black Mediterranean mussels, daily pizzas, and Nonn casserole, which features torn bread and Italian sausage baked in a red sauce with two fried eggs. ﻿Be sure to reserve a table in advance as this popular brunch spot fills up quickly, even when it's not Mother's Day.